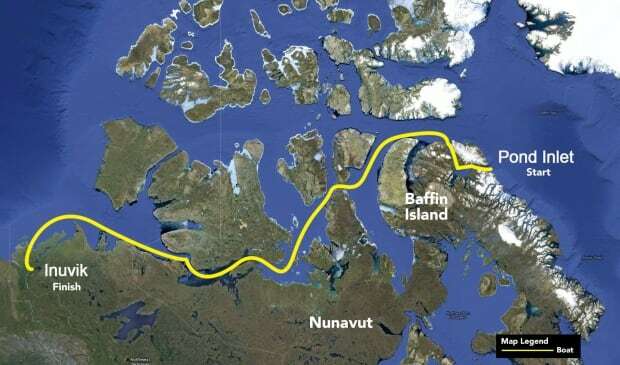 A team of passionate sea women divers will embark on journey, snorkeling over 3,000 kilometres through frigid arctic seas from Pond Inlet, Nunavut, to Inuvik, Northwest Territories. Kitrina Godding, who presented at the GANS GIS Day event last month is one of the women on the Sedna Epic Expedition project. Kitrina is an offshore surveyor, became fascinated with the water at a young age and has continued to have a passion for the ocean throughout the years. She became scuba certified in 2007, has participated in numerous clean-up dives and has dove in 4 different countries to date. The opportunity and challenge provided by the Sedna Expedition was brought to her attention by close friends and she immediately wanted to join the team. Kitrina has been a member and volunteer in the female youth Guiding movement for 18 years and is looking forward to working alongside the youth of Iqaluit. Kitrina relocated to Boca Raton, Florida upon graduation from the Centre of Geographic Sciences (COGS) and worked as a nearshore surveyor conducting beach erosion surveys. During this time she was also a support diver with the Marine Biologists at the company. Kitrina has experience with Real-time Kinematic and Differential GPS, Single and Multi-beam hydrographic data collection, Side Scan Sonar, Seismic, Magnetometer and Sparker surveys. Kitrina conducted studies in the Gulf of Mexico in 2010 after the Deepwater Horizon Oil Spill. Her most current job role consists of operating navigation software which monitors underwater equipment installed on remotely operated vehicles for the purpose of taking geographic positions on seismic survey nodes. Kitrina holds a Bachelor of Science degree in Geology and Geography from Saint Mary’s University in Halifax, Nova Scotia as well as an Advanced Diploma in Marine Geomatics from COGS in Lawrencetown, Nova Scotia.